At the mouth of the Bengal delta sits the Sundarbans, the world’s largest remaining mangrove forest. The Sundarbans is a protean landscape, made up of a dense interlocking set of channels. It is a space where a range of fundamental distinctions—land/water, salt water/fresh water, human/animal, wet/dry, Muslim/Hindu, India/Bangladesh—begin to break down. Spanning the India-Bangladesh border, the Sundarbans is central to a range of imaginations of both the present and the future in South Asia and beyond. It sits at the heart not only of regional, but also—and especially—of global anxieties about climate change. Situated amidst catastrophic imaginations, promises of development, calls for conservation, anxieties about the future, and demands for critical infrastructure, the Sundarbans is a chokepoint in space and time. Chokepoints typically are approached as spatial phenomena—delta-like zones where a range of things are funneled, constricted, and passed on. Temporality matters within chokepoints, but the time that matters most is transit time: how long it takes to move through them. In this understanding, time is framed as a function of space. The Sundarbans is rife with passages that themselves might be understood as chokepoints—dense shifting channels that connect through or dead-end within the vast mangrove forest. These provide transport for humans, animals, ships, and more. The degree to which they choke such flows changes with tide, season, and climate. 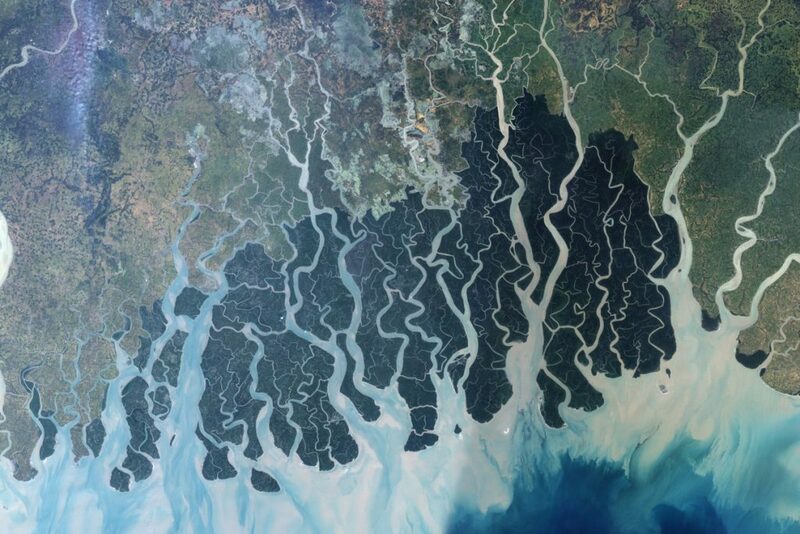 Yet the Sundarbans is also is what we might think of as a chokepoint in time, or a temporal chokepoint—a zone where space is framed as a function of time. A range of phenomena might be described as temporal chokepoints. These emerge in domains such as “just-in-time” manufacturing, where the ability to respond to shifting demand constrains production; evolutionary biology, where population bottlenecks constrict the flow of genetic material to future generations; and agriculture, where the ability to replenish soil nutrients constricts yield. In the Bengal delta, it is a flood of competing imaginations of the future that constrain the possibilities of bringing any one of these imaginations about. The Sundarbans has emerged as one space among many in which intense uncertainty combines with seemingly unbounded possibility—a space in which a range of incompatible visions of the future accumulate to transformative effect in the present. These imaginations, and the projects seeking to bring them into being, posit radically different ideas about conservation and development; contradictory imaginations of residents as footloose and fixed; and mutually exclusive conceptualizations of industrial growth and ecological infrastructure. That is, the Sundarbans is a site in which multiple and often incompatible imaginations of the future and the past accumulate, collide, and constrict. Moreover, they do so in ways that not only limit the possibility that any of these possible futures might be realized but also dramatically transform this space in the present. 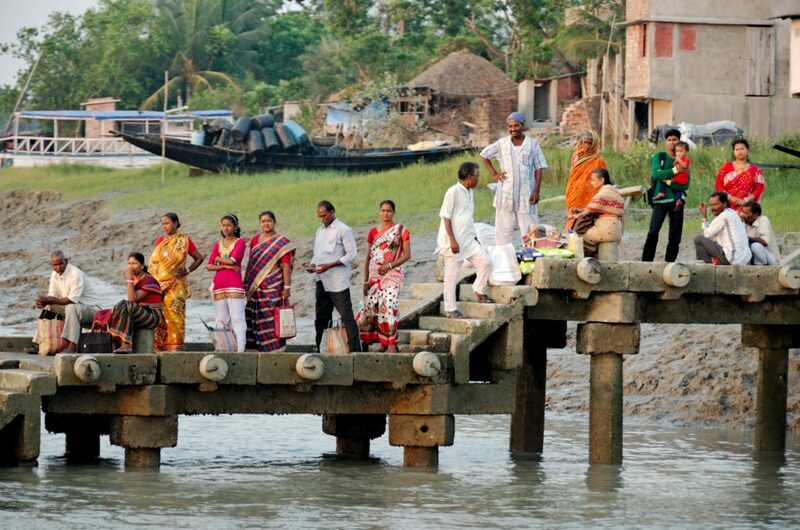 Most immediately, the Sundarbans are a site for fashioning the future in a warming world. The region, extremely vulnerable to a host of projected effects of global warming, is regularly described as a “ground-zero” of climate change. Yet, a range of other future-oriented projects accumulate in this precarious eco-system, some of which imagine it as wasteland, some as opportunity. These competing visions of the future are themselves superimposed upon a set of imaginations that harken back to a moment of historic rupture: the Partition of Bengal in 1947 which split the Sundarbans region in two. Each of these visions imagines the Sundarbans region in distinct ways and through distinct temporalities. The contradictions inherent in these different imaginations accumulate, constrain, and choke—in ways that pose challenges for those who must navigate the space and times of the Bengal delta. 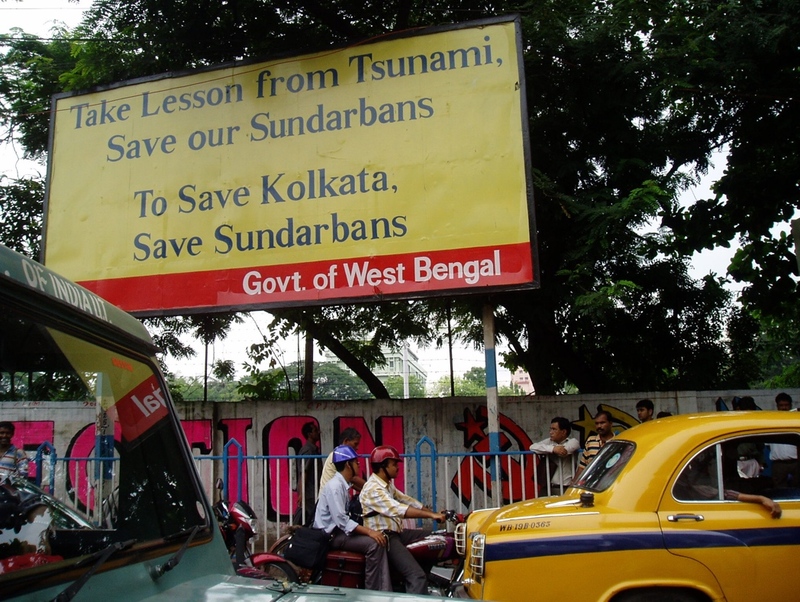 In 2005, while living in Kolkata, India, I began to notice a series of signs and billboards appearing throughout the city (fig. 1). Referencing the catastrophic 2004 “Boxing Day” Tsunami, which killed 230,000 and displaced as many as 1.75 million people across the Pacific Rim, the signs suggested a way of reading the Sundarbans beyond its status as a “natural wonder” and World Heritage site alone. Here, the Sundarbans were framed not only as a site deserving of saving as a public and environmental good in the present. The mangroves also were positioned as critical ecological infrastructure—a space providing security for urban life in coastal South Asia itself. In other words, the mangrove forest was a vital system protecting the future of urban South Asia. As such, it was in urgent need of management through a variety of “political technologies of preparedness” (see Lakoff and Collier 2010). While the signs quickly were covered by the next round of advertisements for cement companies, soft drinks, and cellular providers, the implications of their message continue to resonate. The Sundarbans have emerged in recent years as a symbol of regional and planetary threat and anxiety. Some of this framing can be seen in the increasingly ubiquitous use of a now-iconic Landsat 7 image of the mangrove swamp in discussions of global ecology (fig. 2). The Landsat 7 image offers an abstracted god’s-eye view that reduces this complex space to a single evocative representation. It shows the Sundarbans as a space with neat and well-defined boundaries marking a clear division between human and non-human landscapes. This boundary, visually deceptive in its stark partitioning of space, marks another division of imagination. The dark green of the Sundarbans marks a zone in need of saving. The space beyond, especially in Bangladesh, represents a zone of immanent crisis: a space already imagined, by some, as lost to the ravages of climate change. 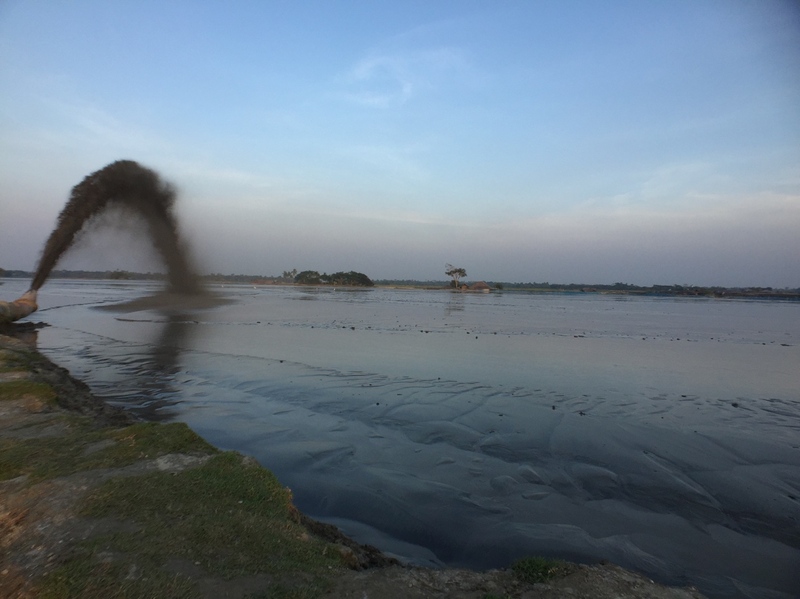 The stakes in this vision of regional climate disaster are dramatically on display in a video from a 2014 New York Times story about climate change in Bangladesh’s delta region titled, tellingly, “Borrowed Time on Disappearing Land.” (Harris 2014). This video, which takes the Landsat image as its template, models what might happen to the coast in the context of a four-meter sea-level rise. It dramatizes the current imagination of the Sundarbans and the greater Sundarbans area as a space of climate fragility: as global warming spurs sea-level rise inundating the coast, a concomitant human displacement triggers another flood—massive migration over the communally-defined border between India and Bangladesh. Here, these flows are represented as in crisis: under threat of catastrophic inundation disrupting ecological, national, and indeed global security. Against this backdrop of regional and global threat, conservation and climate change debates take on marked urgency. They contribute to a framing of the region as a space managed as and in anticipation of future crisis (Cons 2018). The vision of the Sundarbans as a climate hot spot—a zone which must be conserved and saved in order to prevent future climate catastrophe (whether of tsunamis of water or tsunamis of migrants)—in need of urgent management through development and security interventions is only one set of imaginations of the mangroves’ future. In it, the space is imagined as a nexus of geological time, accelerated to catastrophic rates. The means of addressing impending crisis is clear, if difficult to achieve. Preserving the Sundarbans as a means to stem the impacts of climate changes serves to protect the region from deforestation, cyclonic activity, massive human displacement, and more. If this vision of climate change sees the future in impending geological time, other visions frame the region as central to short- or medium-term economic growth—namely the Government of Bangladesh’s vision of soon becoming a middle-income country. Within this shorter temporality, the Sundarbans emerges as a key site of industrial development and growth. This vision is most dramatically articulated in the Rampal power plant. This large, coal-burning plant (the plant has a 900-acre footprint and will have a 1,320-megawatt capacity) is in the process of construction a mere 14 km north of the boundary of the Sundarbans biosphere preserve. Against the protests of environmental activists and organizations such as IUCN and UNESCO, the plant promises, once constructed, to have a range of potentially catastrophic downstream impacts on the Sundarbans’ ecology. Rampal is only the most visible example of industrial development in the region. 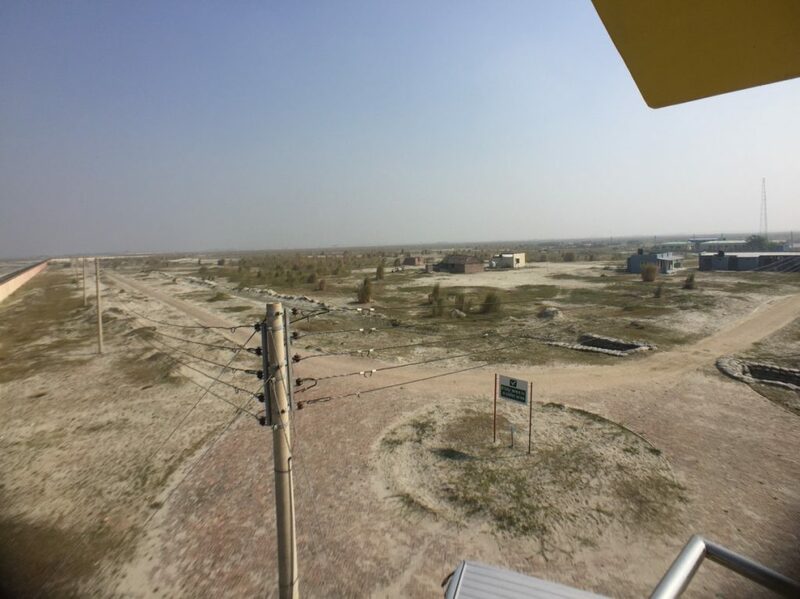 Mongla Port, a “gateway” to the Sundarbans, has in recent years been transformed into a large-scale industrial site replete with designated special economic zones, massive new cement factories, and storage facilities for liquid natural gas. Moreover, the government of Bangladesh recently opened an initiative to allow industrial development in so-called “Ecologically Critical Areas” of the mangroves. This industrial growth relies on river transportation along a series of channels and passageways increasingly clogged with silt—due in part to the construction of upstream dams and barrages in India reducing downstream river flow. The choking of channels by silt is itself a dynamic that threatens not only industrial development but the fragile eco-system of the Sundarbans at large. This threat was dramatically demonstrated by a December 9, 2014, oil spill on the Shela river that dumped 350,000 liters of toxic furnace oil into the mangroves. The tanker had been traveling in a minor canal outside of the main shipping lanes largely because one of the main shipping channels through the Sundarbans had become silted and impassable, forcing the tanker to follow a more precarious route in order to reach its destination. Superimposed over all of these visions of the Sundarbans is another set of questions and temporalities—those of national security. The Sundarbans is a zone of cartographic anxiety, a space that is part of the unfinished project of forming distinct nation-states out of the 1947 partition. The Sundarbans, with the communally-drawn border running through it, historically has been, and remains, an ambiguous space. The mixing inherent in the shifting mangroves, the inability to easily patrol (and often even to locate) its internal and external boundaries, and the refusal of things—people, animals, goods, water, even the land itself—to “stay put” inside the forest trouble notions of fixity and territory. The forest has and continues to be a site for cross-border smuggling, piracy, and various forms of illegal extraction. It is a site not only of the future but also of the unfinished past. This vision of the Sundarbans as a dangerous, criminal, and ambiguous place sets another wave of interventions in play that have implications for both the present and future of the delta zone. The mangroves are sites of militarization, where armed representatives of the border-security forces, para-military groups, the navy, and forest rangers patrol the waterways. The mangrove forests are a place at once impossible yet critical to control, a sensitive space that must be regulated and brought firmly into the fold of Bangladeshi territory even as its geography and ecology denies such integration. The Sundarbans is a complex articulation of a common problem in environmental politics—the inability to resolve a range of competing understandings and imaginations of what land can and should be. Thinking of this space as a temporal chokepoint—one where the possibility of achieving any single vision of the future is constrained by the volume of projects seeking to bring these visions about—provides a different way to frame debates over ecological change, conservation, and growth. The Sundarbans is a space that is over-imagined—one in which no single operative logic of planning wins out and where the contradictions of possible futures threaten to constrain each other in the present. One obvious example of this are the ways that the construction of the Rampal power plant sits uncomfortably and, perhaps, catastrophically alongside projects seeking to preserve the Sundarbans as a critical ecological infrastructure and habitat. Yet other and more immediate impacts of this clogging of temporalities abound. As often as not, these projects take local populations as their targets. The borderlands around the mangroves are littered with quixotic projects seeking to actualize the future—climate-smart development projects seeking to stem migration, demonstration projects imagining the fraught delta as a staging ground for global responses to climate, new conservation policies seeking to regulate livelihoods based on small-scale extraction from the forests, and policing projects designed to crack down on piracy and criminal activity. This accumulation serves as a reminder that the choked temporalities within this zone yield more than a conceptual or future problem. The sedimentation of ideas and imaginations within the Sundarbans also has dramatic and often troubling implications for the present. Research for this article was undertaken as part of the collaborative study, “Chokepoints: A Comparative Global Ethnography”, supported by the National Science Foundation, 2016-2018, Award #BCS-1560531. Cons, Jason. 2018. “Staging Climate Security: Resilience and Heterodystopia in the Bangladesh Borderlands.” Cultural Anthropology. 33(2): 266-294. Lakoff, Andrew and Stephen J. Collier. 2010. “Infrastructure and Event: The Political Technology of Preparedness.” In Political Matters: Technoscience, Democracy, and Public Life, Braun and Whatmore eds. Minneapolis: University of Minnesota Press. Harris, Gardiner. 2014. “Borrowed Time on Disappearing Land: Facing Rising Seas, Bangladesh Confronts the Consequences of Climate Change.” The New York Times (March 28, 2014). link.